Jan likes a good project. For the past month or so, the immersion circulator and sous vide has been Jan’s project. You may have seen this method of cooking featured on a cooking show somewhere (most likely Top Chef or Iron Chef America), read about it in the New York Times (link here), or maybe even eaten food cooked this way at a restaurant. For the rest of us, the literal French translation is: under vacuum, and it basically means to cook in a vacuum sealed bag. Well, when you say it like that and realize the French words only sound glamorous when you don’t know what they mean, the outcome of this meal makes a lot more sense. Let’s back up to the beginning. Starting several weeks ago, Jan hunkers down with his laptop to do some online research on immersion circulators. Food cooked via sous vide is supposed to be some magical thing reserved for restaurant chefs and molecular gastronomists, a technique not typically used by most home chefs, so of course, the perfect challenge for Jan.
With home immersion circulator machines a pricey $500 and up, Jan determines instead of buying the SousVide Supreme from Sur La Table (link here), he’ll make his own. So he starts tinkering with options for building his own immersion circulator (here’s a link to a website where you can make your own machine). He finds a very limited amount of information available online on sous vide. As he’s designing plans for his very own immersion circulator, he becomes worried about electrocuting himself (and I agree there’s good reason to be wary of combining water and high voltage currents). So, using his understanding of how the immersion circulator works, he determines that a water bath (like you may have used in your chemistry class) will do the same job. 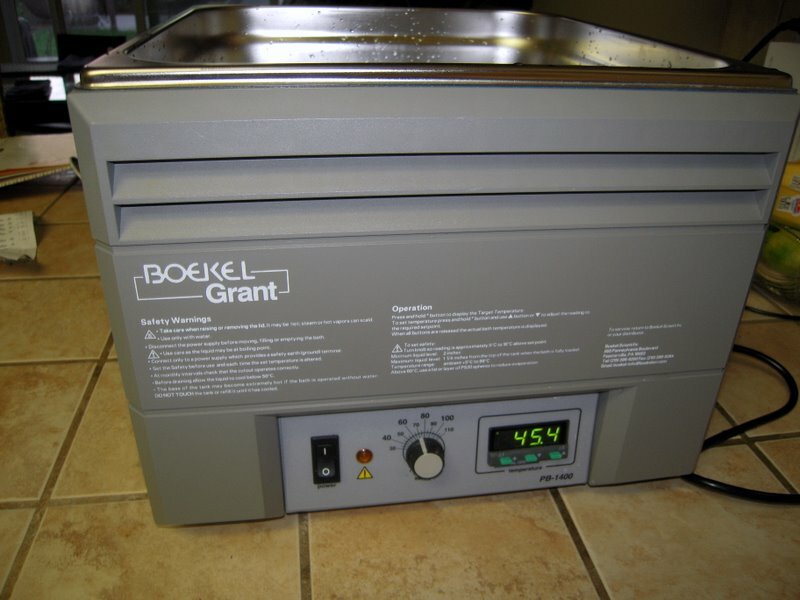 So Jan buys a water bath machine from eBay (and insists on the importance of buying a new water bath, as those used in labs could have traces of chemicals leftover from whatever experiments were done with them previously). In addition, he purchases a vacuum sealer (the Kenmore Seal-N-Save) after reading several reviews and determining that he’s buying the best one for the price. Over the course of a few days, different items keep arriving to our doorstep from Amazon.com. 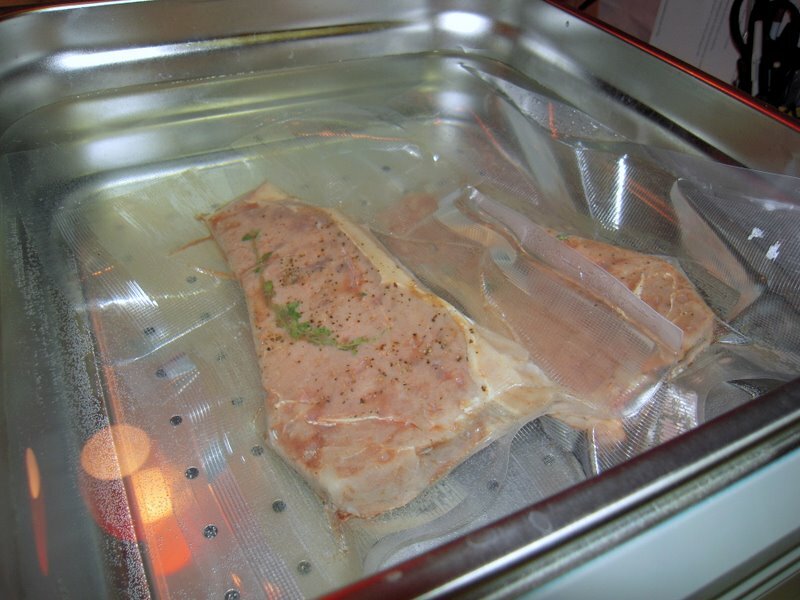 First is the Sous Vide brand vacuum sealing bags, next, the vacuum food sealer. Last is the water bath, which Jan deems The Coolest Thing he’s Bought in a While. By now you’re probably wondering why all this effort to cook something, when we’ve got a stovetop, oven, and a grill to choose from. Here’s Jan’s take: cooking food using an immersion circulator keeps everything at a constant temperature. So theoretically, you can never overcook something. It also keeps flavor locked inside, and the slow cooking makes for a perfectly tender texture. The food is cooked at the lowest temperature possible that is safe for each ingredient, therefore preserving much of the integrity of the original ingredient. And besides, Jan always liked Chemistry class. With all this theory and science presented to me, I had grand expectations. 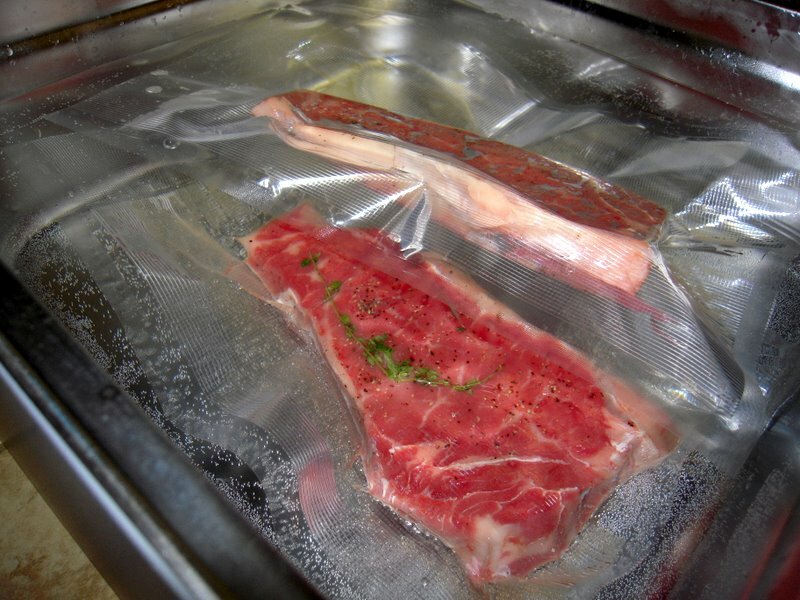 I assisted Jan in vacuum sealing the meat, and placing it into the water bath (which he had set at 140 degrees F. If the temperature is under 130, you could run into problems with bacteria growth). After 2 hours, Jan said the meat was ready. In the water bath, this could technically stay for many more hours. But I was scared. 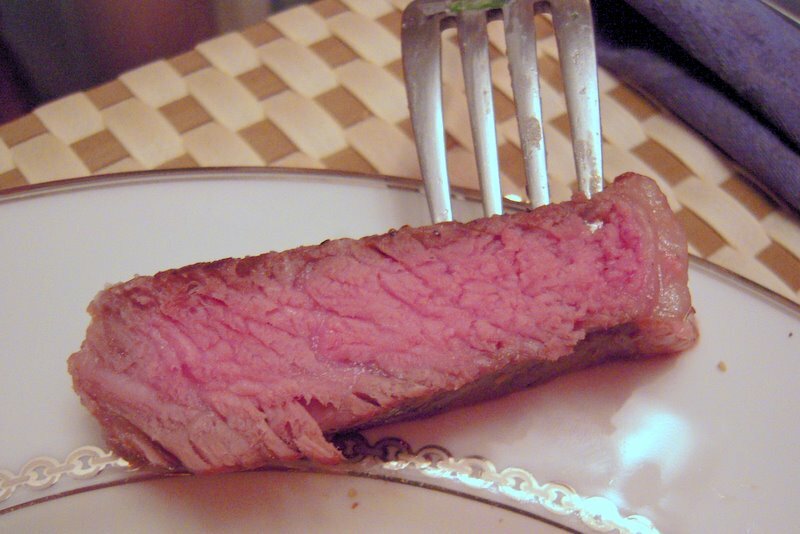 Instead of turning a beautiful color that it usually does on the barbeque, my steak was a muddled gray-purple color. 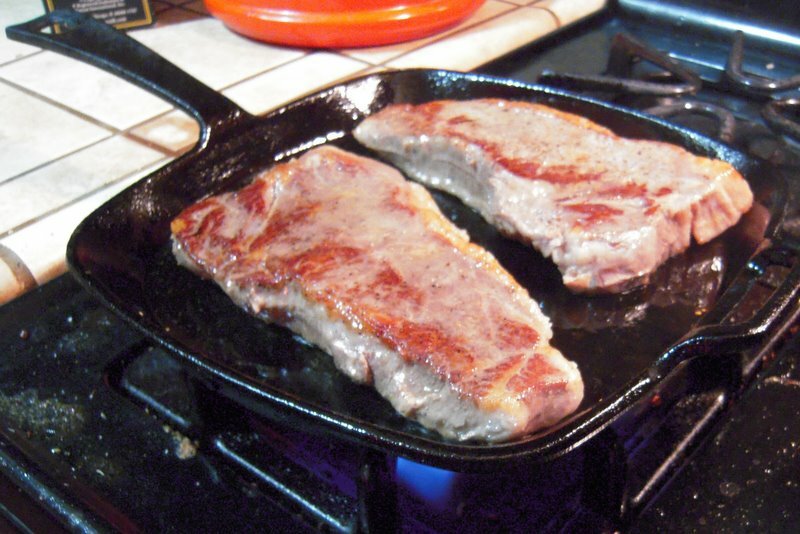 Both for food safety and presentation, Jan said there was one step left–pan frying. This further cooked the outside of the steak (where any bacteria might have migrated to while cooking in the water bath), and also gave the steak a more appetizing, brown color. My sous vide New York Steak was served next to a loaded baked potato. I went in for my first bite. Then I went for the next. I asked Jan if he’d seasoned the meat. He said he did, but not too much, as he’d read that the flavors of salt and pepper tended to become more intensified inside the sous vide bag. I added a sprinkling of salt and pepper to my steak and went in for a few more bites. I felt that the steak was missing something that I couldn’t describe. “The umami flavor?” I guessed (umami is a Japanese term for the fifth taste, meaning savory, in addition to bitter, salty, sour, and sweet tastes). Jan agreed. Something wasn’t right. “Is it the texture?” I asked. My steak was smooth–usually a description I’d reserve for a medium rare cooked piece of filet mignon, not New York Steak. We agreed that the texture was different, but Jan cut a piece through the middle and showed me how perfectly the meat was cooked through. I tried to like it, but I wasn’t convinced. The more bites I took, the worse it tasted to me. I felt sad. I knew how excited Jan had been for his experiment, and my expectations had been so high. I had wanted to like this so badly, but I just couldn’t. Jan insisted that this was his first try with the technique. And on top of that, an experiment. We came back to our discussion of the reasons for using this technique. Jan said, after some research, he wasn’t sure if sous vide wasn’t all it was cracked up to be, since restaurants probably do this so their food will never be overcooked. They may not do this because it’s the best way to cook something, maybe just the most foolproof. The more we talked about it, the more convinced I became that molecular gastronomy was turning meal preparation into an overly scientific endeavor. But, Jan wanted a project, and this project had yet to run its course. So, we agreed to continue the experiment for future meals, and hopefully tasty results aren’t far off. I wonder if it were the process in general that wasn’t a success or the actual instrument used? I think the instruments used are fine, it’s the people that need adjustment! I think it’s a technique that needs a lot of fiddling to get right. We had this dinner last week, and last night, we tried again with infinitely more positive results, so the experimentation continues. I’ll be updating with our progress in upcoming posts. its kool that u guys hacked together ur own! lol. Maybe you need to add more seasoning, maybe fresh herbs? It is an old french technique i think, so maybe try different recipes? This might be one of my favorite entries yet, just due to the insight into Jan’s process, and quotes such as “which Jan deems is ‘the coolest thing I’ve bought in a while'” (which I could so picture him saying) and “Well, when you say it like that and realize the French words only sound glamorous when you don’t know what they mean, the outcome of this meal makes a lot more sense.” Hilarious! 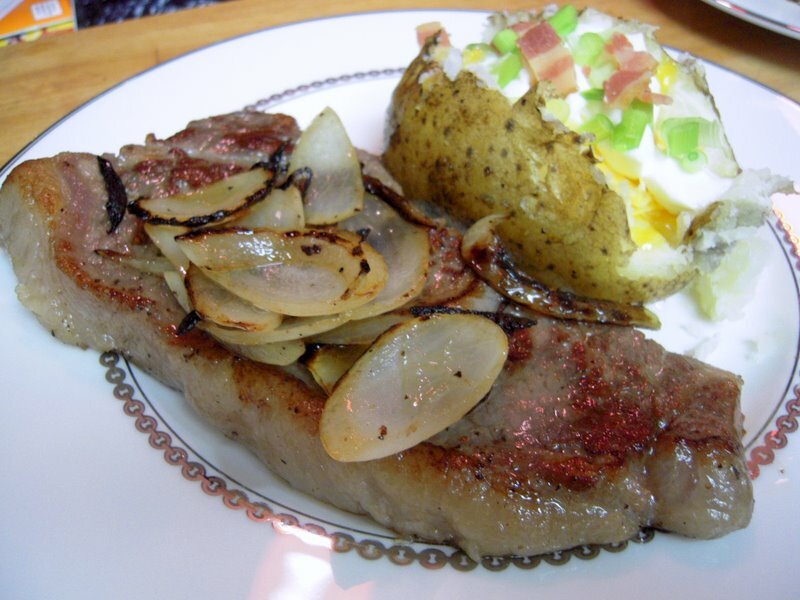 Beth I used Choice New York Steak. Maybe one of my future experiments I will compare grass feed beef to the regular store bought beef. As for the taste it tasted too much like Beef for Anna, I don’t think I put enough seasoning it was just missing something. What I have found out is sous-vide is only one part of the process of making a complete meal. It’s almost like prepping for a final process. 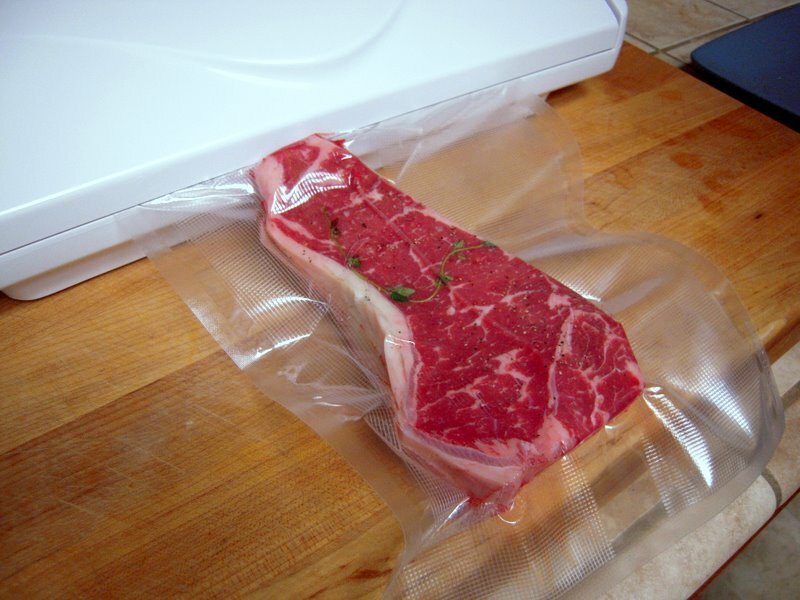 I’m still slightly suspicious of the whole sous-vide thing. But I will be doing more experimentation. As for my equipment, I am using a lab grade 14 L. digital water bath that has accuracy of 0.2 deg C.
How could it taste too much like beef? Isn’t that the whole point of eating meat, like, tasting it? lol. So I guess this means that we won’t be coming over for sous vide anytime soon…but if you ever feel like you’ve perfected the process and want people to test it on, invite away!